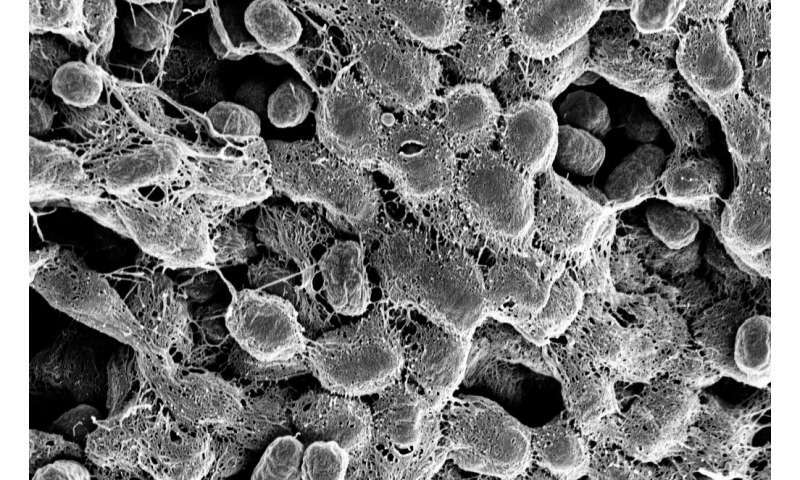 An electron microscope image of UTI-causing biofilm made up of E. coli bacteria. Credit: Lynette Cegelski. Antibiotic overuse can lead to resistance and impacts on the natural bacteria that share our bodies, called the microbiome, said study co-leader Lynette Cegelski, an associate professor of chemistry at Stanford's School of Humanities and Sciences. "There are many ways to target disease and if you just target a specific bacterium's virulence strategies, you could still prevent infection and also eliminate the total insult to your microbiome," she added. Produced by plants, algae and some bacteria, cellulose is the most abundant organic polymer on Earth. It's also one of the best studied, since it's used to produce everything from paper to ethanol fuel. It was thus surprising when Cegelski's team announced earlier this year that they had discovered a chemically unique form of cellulose, called pEtN (for the chemical group phosphoethanolamine), in the bacteria E. coli. That finding, which was published in Science, showed that pEtN cellulose is a crucial component in the bacteria's biofilm, a slimy secretion that bacteria use to share nutrients and to protect themselves against antibiotics and the immune system attacks of their host. In the new study, Cegelski's group showed that pEtN also plays an important role in UTIs. UTI is one of the most common infectious diseases worldwide and E. coli is the one of the main culprits. "Our experiments here reveal a specific function for the cellulose in which it serves a mortar-like role to enhance the adhesion strength of bacteria with bladder epithelial cells," said study co-leader Gerald Fuller, the Fletcher Jones II Professor in the School of Engineering. The discovery was the result of a chance encounter at a Stanford lunch event, where Fuller learned that Cegelski's group was seeking a way to measure how strongly a layer of E. coli bacteria sticks to a layer of isolated bladder cells. "Oh, I can help you," Fuller volunteered. A few years earlier, Fuller had developed an instrument, called the Live-Cell Monolayer Rheometer (LCMR), to investigate the adhesion of contact lenses to corneal cells. "We wanted to know whether cells from your eye adhere to the underbelly of contact lenses when you take them off, and we found that indeed they do," Fuller said. Live-Cell Monolayer Rheometer (LCMR) instrument used to test bacteria shear strength in the study. Credit: Gerald Fuller. The scientists realized that with a few tweaks, Fuller's instrument could achieve what Cegelski had in mind. 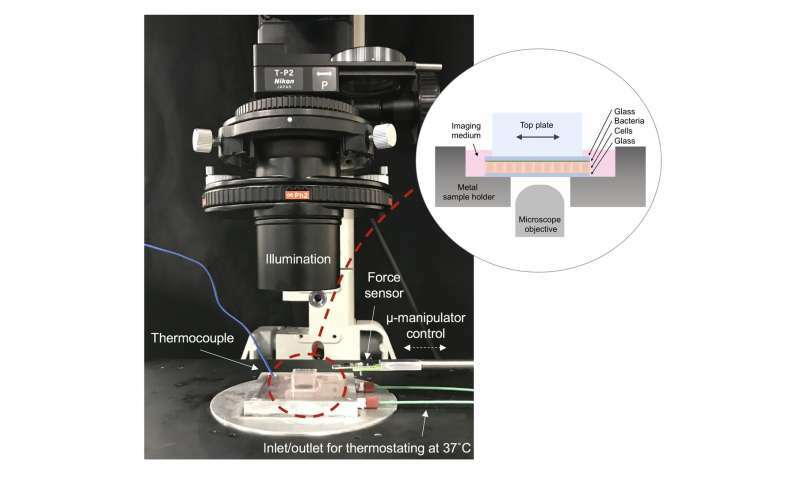 "For these experiments, we improved the microscopy to better visualize the contact between the bacteria and bladder cell layer during measurements," study first author Emily Hollenbeck, a former joint-graduate student in both Cegelski and Fuller's groups. "This was an important check to ensure we were always measuring adhesion forces between these very thin layers." Getting the bacteria to grow as a single layer also proved challenging, and it took Hollenbeck several tries before she was successful. "Creating uniform layers of bacteria and bladder cells was highly important for obtaining reproducible LCMR measurements," Hollenbeck said. "It was especially challenging to create these uniform layers out of materials that are continually growing and adapting to their environment." Previous studies had already noted that pEtN cellulose and cell-surface fibers called curli are braided together to create E. coli biofilms. And curli have been implicated in kidney infections and sepsis. "The more severe the infections, the more likely those bacteria were making curli," Cegelski said. In one experiment, they attached E. coli whose biofilms contained both cellulose and curli to the top plate of the LCMR and then brought it into contact with a bottom plate containing bladder cells. The scientists then quickly sheared the top plate horizontally by a tiny amount, and the resulting level of adhesive stress gave them a quantitative measure of the bacteria's "stickiness." What they found was that the bacteria that produced both curli and cellulose exhibited the highest adhesion strength, followed by the curli alone, and lastly the cellulose alone. "Without cellulose, the cells break away very easily from the bacteria," Fuller said. "The cellulose acts like a glue to really help hold everything together." The finding suggests that an approach to treating UTIs that does not involve antibiotics may be possible. "Attacking the cellulose could be a great alternative to traditional antibiotics as preventing bacterial adhesion could help break the cycle of infection," Hollenbeck said. "This type of treatment also avoids the 'life-or-death' pressure of traditional antibiotics that lead to drug resistant mutations."